We are the leading manufacturer and trader of the LED Etched Signages. 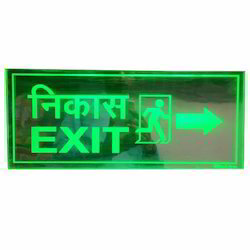 We provide LED Laser Etched Exit Signage to our client with the assurance of maintaining its original finest quality. Our LED Laser Etched Exit signage provide impressive visual impact. These LED Laser Etched signage are particularly suitable for use during night time. We offer our products in many shapes and sizes and can also customize them according to client’s requirements. We offer our range at affordable rates.